Home » PIllows » What’s the Best Pillow For Neck Pain and Migraines? What’s the Best Pillow For Neck Pain and Migraines? After a long and tiring day, the only thing you might want is a good night’s sleep. Unfortunately, if you suffer from neck pain or migraines this can be an impossible task. You spend more time tossing and turning than you do sleeping. Fortunately, a good pillow can help solve some of your pain issues and here we’ll review some of the best pillows for neck pain and migraines. Some people think that a migraine is a bad headache, but it is so much more than that. While a headache can be painful and frustrating, migraines can be debilitating. A migraine is a severe headache that is often preceded by sensory warnings like extreme sensitivity to light or sound, tingling in the extremities, and sometimes nausea and vomiting. In some cases, though, migraines will occur suddenly without any type of warning. A migraine can also last much longer than a regular headache, sometimes for even days at a time. It is difficult to help ease the pain of a migraine with regular over the counter painkillers and sometimes require more powerful drugs. The cause of migraines is still largely unknown which makes it very hard to treat. How Is My Pillow Making My Migraines Worse? It might be hard to blame all of your migraine problems on a bad pillow, but it could be part of the issue. While we don’t know what causes migraines, there are a few things that can trigger one. There has been research that shows when the nerves in the neck and at the base of the head are damaged or irritated this can cause pain in the face, head, and neck. Pain in these areas is a common trigger for a migraine. One of the most common irritants of the nerves in the head and neck is improper support and alignment while sleeping. The biggest culprit is usually your pillow. A pillow that doesn’t properly support your neck and cradle your head will lead to aches and pains while you sleep. Those aches and pains could very easily lead to a migraine. What Should A Good Pillow Do To Help My Neck Pain And Migraines? The two biggest components of a good pillow are going to be support and proper alignment. Both of these things might not be easy to find in a traditional pillow, but a good neck pillow will solve these issues. During the day, you have control over your posture and the position of your spine. While you sleep, though, you might put yourself into an awkward position that is going to end up hurting you when you wake up. A good pillow for neck pain and migraines is going to gently guide your head, neck, and spine into the proper alignment. Keeping your body aligned while you sleep is a very simple way to cut down on the amount of pain that you experience when you wake up. A regular pillow often doesn’t have good support in the neck area. It might put your head at an awkward angle or go flat the longer you sleep on it. If you don’t have good neck support this is going to lead to extra strain in that area and could possibly trigger a migraine. If you get a pillow that is designed to eliminate neck pain, it is going to have the proper support for your neck. Some pillows will come with a contoured design meant to keep the natural curve of your neck. Other pillows might have a concave center and raised sides to offer more support in the neck region. The design you choose is going to depend on your sleeping position and personal preference. The important thing to keep in mind is that you choose a pillow that is comfortable to you and solves your pain needs. This might seem like a no-brainer, but sometimes people get so caught up in solving their neck pain issues that they don’t take into account the level of comfort a pillow provides. Just because a pillow is specially designed to ease neck pain and reduce migraines, if you don’t find it comfortable then it’s not going to help you at all. This is why it’s important that you find a pillow that works for your own needs. Make sure that you can try a pillow out before you commit to it being your full-time pillow. Should I Take Into Account The Material The Pillow Is Made Of? Yes! There are a variety of options that are available when it comes to a neck support pillow and each choice has its own advantages and disadvantages. A pillow filled with buckwheat hulls might sound odd, but it is actually a great option if you suffer from neck pain or migraines. 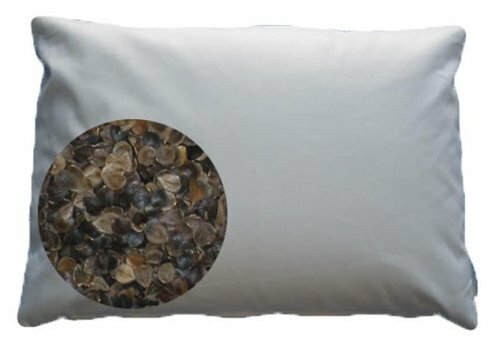 These types of pillows are filled with dried out buckwheat hulls, which are light and moveable. Some pillows will also have an extra layer of poly-blend fiber to cover the hulls so you aren’t lying directly on the hulls. Others are just the hulls in a cotton case. Buckwheat hulls might take some getting used to, but they offer unique support because you can adjust the pillow to your own shape and needs. It also won’t ever go flat like some foam or poly-blend pillows will over time. Sort of like a waterbed for your head, these pillows are great for people with neck pain or migraines. A water pillow will feature an inner layer that can be filled with water and then has polyester filling around the water base. What is nice about these types of pillows is that you can customize the amount of support you want or need by adding more or less water. The water base will also adjust to your head as you move, which can be nice if you move around a lot while you sleep. Memory foam is by far one of the most popular choices when it comes to pillows. Its special ability to mold to the unique contours of your body make it a good option for those who suffer from neck pain. It also eliminates pressure points that regular pillows might cause, which is good to reduce triggers for migraines. You can find a lot of memory foam pillows out on the market today and they come in many shapes and designs to fit your particular needs. These kinds of pillows might be a little more expensive, but you are paying for a product that is going to last a long time. This memory foam pillow features a contour on one side to help support the natural curve of your neck. There are two layers of memory foam in this pillow, the core is high-density support foam and the outer layer is a medium softness foam for comfort. Yes, this is one of our pillows (Elite Rest). We wanted to mention it here as this is our top of the line latex pillow and is a great example of the benefits of thin latex inserts. It provides back sleepers, stomach sleepers and side sleepers that the extra support they need when they sleep at night. At 2.75 inches this is one of the lowest profile pillows on the market and yet because of the latex technology it keeps its form. And because it's 100% natural, it is hypoallergenic, anti-microbial, mildew resistant, anti-dustmites, and anti-fungus! The Mediflow water pillow is a good example of a pillow that uses water and polyester filling to provide neck pain relief. You can fill the inner core with tap water and the special tool provided, to your desired level of firmness. The inner core is then wrapped in a polyester filling and covered with a 100% cotton pillowcase. The nice feature of this pillow is that the water base automatically adjusts the pillow to the movement of your head so you don’t wake up every time you switch positions. You can also clean this pillow in the washing machine and it comes in two different sizes. The Form-Fit pillow is made of a combination of buckwheat hulls and three layers of quilted cover. You can adjust the amount of buckwheat hulls to your desired level of comfort. The pillow is also designed in a way to provide optimal support to your neck and shoulders so you don’t experience any pain. This pillow is good for side and back sleepers because you can adjust the pillow to support the contours of your head and neck. The quilted cover is made of bamboo so it is hypoallergenic and antimicrobial. You will also get extra buckwheat hulls to make sure your pillow is always at the right level. The Form-Fit pillow comes with a 10-year warranty and will fit most standard pillowcases. The Beans72 is another buckwheat hull filled pillow, but it is thinner in design and might be a better option if you need a thinner sleep surface. It is filled with 100% US grown, organic buckwheat hulls and covered with 100% organic cotton. This pillow will stay cool all night long because the buckwheat hulls allow air to move through the pillow. It is also good for people with allergies because it is hypoallergenic and dust mite resistant. The Beans72 pillow will also work for all sleep positions, so it is good if you move around while you sleep.